To give New Zealanders a wake up call about homeloan interest, we collaborated with the Reserve Bank to access millions in real, shredded cash. Homeowners opened their mailboxes to find $1,000 in shredded cash, learning how BNZ could help them save $156,000 on a typical $300,000 loan. 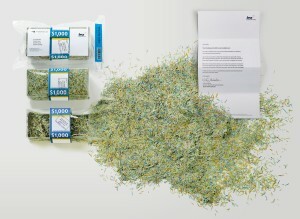 To provoke a visceral reaction to the waste, shredded cash was displayed on the streets and in banks nationwide.